If you won’t listen to ads, you can’t use Spotify for free. 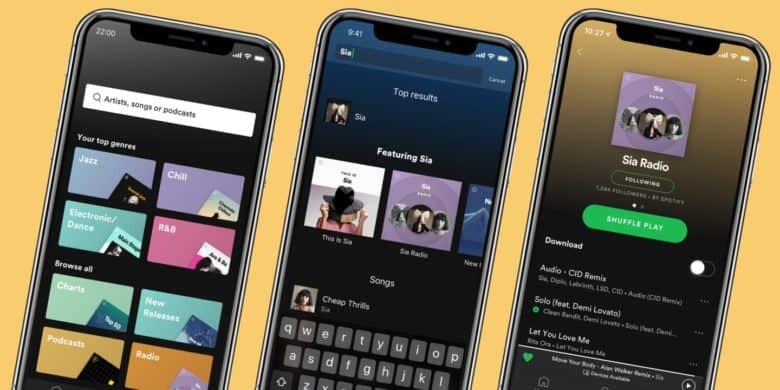 Spotify today rolled out a big update for its iOS app, introducing a refreshed design with personalized search. It also adds a new feature called Artist Radio, which offers an endless playlist of tracks based on your favorite musicians or songs. Apple Music might come baked into your iPhone, but Spotify remains the main choice for around 83 million paying subscribers around the world — more than 50 million of which are based in the United States. To stay at the top, and prevent users from switching for Apple’s exclusives, Spotify continues to improve its service and add new features for subscribers to enjoy. The latest come in a big update to its iOS app. You will immediately notice the refreshed design after installing the latest release. It’s streamlined and it makes it easier to navigate the app. There are three tabs to choose from that are self-explanatory: Home, Search, and Your Library. The Home tab is where you’ll find recommendations, highlights from your favorite artists, and music you’ve recently listened to. Inside the Search section, you’ll find some changes that help make finding music a little easier. Search is now personalized, which means you can search within your “top genres” to filter out those you don’t typically listen to simply by tapping one of the genre buttons. The search bar continues to perform as you would expect, so you can use this to include everything. Once you’ve found an artist you want to listen to, or a track you enjoy, you can use the new Artist Radio feature to fetch an endless playlist based on your tastes. They’re regularly updated to keep things fresh, and downloadable so that you can listen offline. The latest Spotify update is available globally on iOS today, but it might take a while to roll out to everyone. Premium subscribers will see it first, Spotify says. If you don’t have it yet, just check back later.